Alleged victim of ritual murder by the Jews of Lincoln in 1255. He appears to have been the illegitimate son of a woman named "Beatrice," and was born in 1247. He disappeared July 31, 1255, and his body was discovered on Aug. 29 following in a well belonging to the house of a Jew named "Jopin" or "Joscefin." On promise of having his life spared, Jopin was induced by John of Lexington, a priest who was present at the time of the discovery, to confess that the child had been crucified by a number of the most prominent Jews of England, who had gone to Lincoln on the pretext of a wedding. The remains of the lad were taken to the cathedral and were buried there in great pomp. Henry III., on arriving at Lincoln about a month afterward, revoked the pardon of Jopin, and caused him to be dragged around the city tied to the tail of a wild horse, and then hanged. 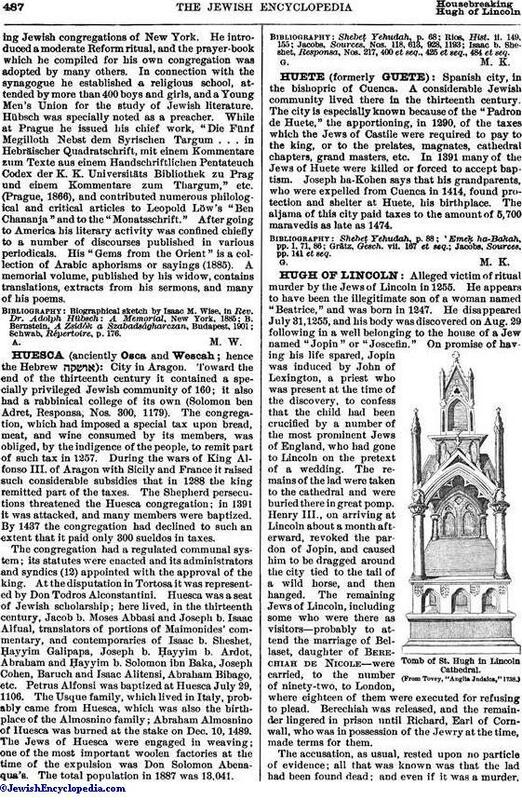 The remaining Jews of Lincoln, including some who were there as visitors—probably to attend the marriage of Bellaset, daughter of Berechiah de Nicole—were carried, to the number of ninety-two, to London, where eighteen of them were executed for refusing to plead. Berechiah was released, and the remainder lingered in prison until Richard, Earl of Cornwall, who was in possession of the Jewry at the time, made terms for them. Tomb of St. Hugh in Lincoln Cathedral. 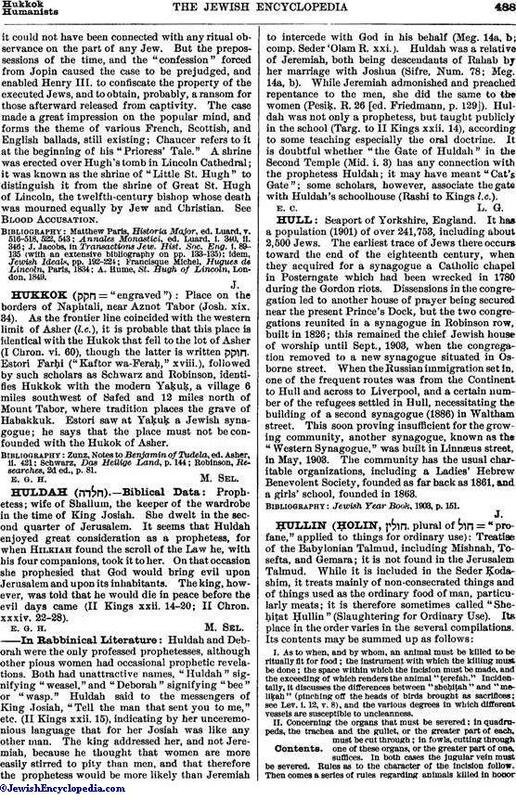 The accusation, as usual, rested upon no particle of evidence; all that was known was that the lad had been found dead; and even if it was a murder,it could not have been connected with any ritual observance on the part of any Jew. But the prepossessions of the time, and the "confession" forced from Jopin caused the case to be prejudged, and enabled Henry III. to confiscate the property of the executed Jews, and to obtain, probably, a ransom for those afterward released from captivity. The case made a great impression on the popular mind, and forms the theme of various French, Scottish, and English ballads, still existing; Chaucer refers to it at the beginning of his "Prioress' Tale." A shrine was erected over Hugh's tomb in Lincoln Cathedral; it was known as the shrine of "Little St. Hugh" to distinguish it from the shrine of Great St. Hugh of Lincoln, the twelfth-century bishop whose death was mourned equally by Jew and Christian. See Blood Accusation. A. Hume, St. Hugh of Lincoln, London, 1849.